Prepositions are handy little words that demonstrate concepts such as directions, location, time, duration, and relations. Some common examples we use every day include: to, from, for, over, around, past, by, at, in, on, up, down, around, and through. Prepositions can stand on their own or they can combine to form longer strings of words which we call "prepositional phrases". These phrases make your writing rich and vibrant. In these pages you will find two lessons that include many examples, as well as interactive exercises. 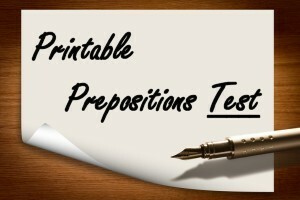 English prepositional lists are presented as well (categorized by types), and a full test is presented (with an answer key attached seperately). In this lesson you will get to know what prepositions are, and learn tips how to identify them and choose the correct ones inside sentences. There is a special emphasis on the words: In, On and At, as you will learn when you should best use each one. 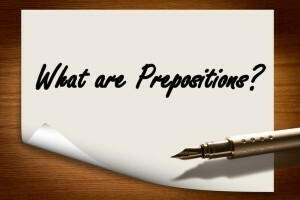 Now that you have learned about prepositions it is time to learn about how they relate and interact with other parts of a sentence. 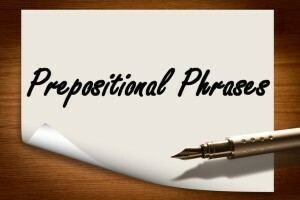 Prepositions attach to other words and group of words in a sentence to form what we call prepositional phrases. The preposition ‘to’ can join with the words ‘the store’ and we end up with the prepositional phrase ‘to the store.’ These phrases make your writing rich and vibrant. Test you skills and comprehension with this comprehensive multiple choice test. In this test you will be presented with sentences with blank spaces, and asked to select the best preposition (single words or phrases) to complete the blanks. The questions are practical and similar to what you may find in other tests and scenarios in any classroom setting. Here you will find lists of the most common prepositions. These words are grouped into several smaller lists based on their functions- time, direcion and location. These lists make great reference sheets to print out and keep on hand to look back to during your writing.